Given its upscale location off Old Town Square, the classy ambience of Marie Borenstein’s No Stress Café comes as little surprise. Less expected is the wide range of wares for sale – from chocolate to chairs. No Stress officially sells Belgian chocolates for CZK 16 each, or antique Art Deco armchairs for CZK 66,000 a pair. In 2001 Borenstein sold the Café Colonial and the Le Patio venues, which she had established soon after her arrival in Prague in 1991. Intent on enjoying some free time, Borenstein says that she very quickly became depressed. Despite continuing in the family tradition: she was born in the Belgian Congo where her father ran a coffee and cocoa plantation, as the distributor of the Illy coffee brand, she missed the hands-on management of a restaurateur. Opening No Stress just in time to welcome the Vltava as one of her first customers in the summer of 2002, at the time she wondered if she had chosen the right name for her bright and busy venture opposite the Spanish Synagogue in the heart of one of the city’s best-loved restaurant districts. Sandwiched between a café and patisserie at the front and shop section, the restaurant area features simple tables amidst towering antiques and works of art. Borenstein’s multifarious passions for food, health and travel drive the fusion-menu. Whilst traditional powers such as French and Italian cuisine make the odd appearance at No Stress, it’s the east end of the Eurasia that colonises this corner of Prague. Algerian chef Kheireddine Benmisi, formally the patisserie chef at La Perle de Prague, works alongside the owner in developing dishes from her “thousands of cookery books”, her regular trips to restaurants in the major cities of the world, and in particular her investigations into the hotspots of Asia. Borenstein admits a predilection for Chinese food – her favourite dish on the menu is Indonesian seared rice with shrimp and chicken – and says that she’d love to open a purely Thai restaurant. Over a glass of “energetic soup” – a sweet, fluorescent green-pea consommé with salmon tartare – Borenstein explains that the daily menu combines dishes to ensure the correct mix of carbohydrates, proteins and vegetables, and is always introduced by a soup containing no cream and cooked for the minimum length of time to protect vulnerable vitamins and nutrients. Despite a healthy contingent of business-people, lunching shoppers and “high-end tourists from the city’s top hotels”, Borenstein says that marketing remains the hardest part of the job. Her wish to bring in more “fashion people” is unlikely to boost takings extensively – unless the price of the salads rises hugely. The venue is scheduled for an extensive redecoration in April, which will center the presentation more directly on the restaurant. Moreover, those not wanting to make the trip to the center will soon be able to sample the spicy zest of Borenstein’s dishes anywhere they wish. 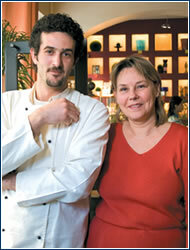 In tandem with Benmisi, the Belgian has recently acquired a catering company: Le Traiteur. The venture will service small functions so that Le Traiteur can offer a similar emphasis to No Stress on providing a special and relaxed atmosphere. This depends on controlling all aspects of the environment says Borenstein. She points out the music as an example. A jazz aficionado, Borenstein travels regularly to festivals around the world, and creates the soundtrack heard in No Stress at home from her “thousands of CDs”. She explains that no one else is allowed to touch the music. So wouldn’t it be much easier to run a standard restaurant selling only food instead of offering jewelry, coffee machines and Czech art also? Borenstein lets out a resigned chuckle, having heard the question many times. “Why do I need to concentrate on just one thing my whole life? I know it might not make much sense business-wise, and of course I have to make money to pay the salaries and the rent – but that’s not enough,” she says. IF YOU TYPICALLY seek out a corner table in a cozy café to enjoy your Montecristo and Martell, then this recently opened venue off Old Town Square may become your favorite haunt. 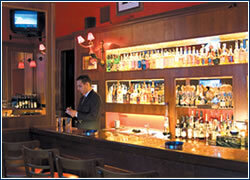 Small and intimate, with subdued lighting and music, this local link in the successful New York chain features an extensive menu of whiskies, brandies, cognacs and other cocktails, along with an impressive humidor stocked with fine Cubans and Dominicans. Champagne, port, and other wines are also available, as is a selection of “light fare” and desserts, to keep up one’s stamina for… reading. If you’re heading towards Mělník and you’re hungry, don’t hesitate – turn left before the old Štěpán bridge. In a 200-year-old but newly refurbished roadside tavern, Na Štěpáně, you’ll certainly find something good to eat. A big blackboard displays the daily choices, including two soups and ten main dishes. If you have time, choose one of the menu’s interesting offer of traditional dishes in modern form, such as “our gradma’s goose livers” – a bit sinful, but worth it. 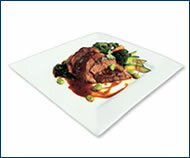 Most of the ingredients are of local provenance: fish, poultry, wild game, and vegetables. 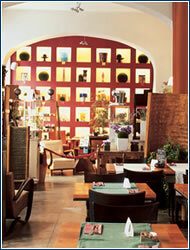 The beef, pork, and lamb all come from the poetically named “Golden Strip of the Czech Land”. The bountiful wine list is also worth a perusal. 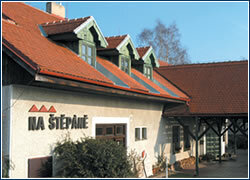 Compared with nearby Prague, Na Štěpáně offers its guests a truly fine ratio of quality cuisine for reasonable prices.